Note: This post contains affliate links. 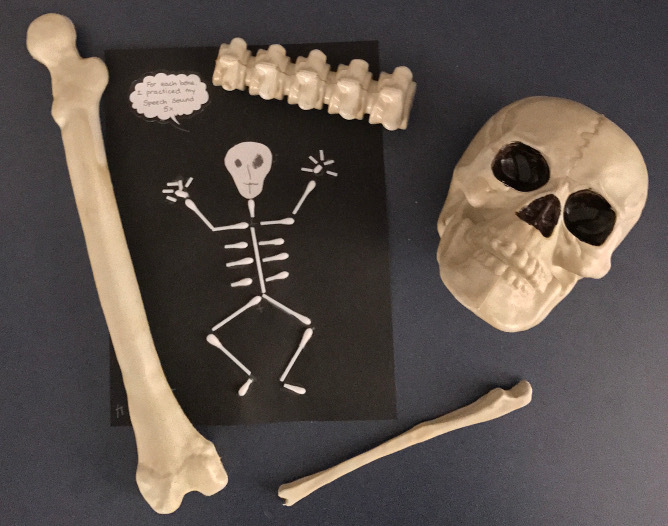 Given all of the spooky skeletons everywhere in the month of October, our monthly STEM unit revolved all around bones and the skeletal system. Just as with the unit on Density, you can incorporate tons of language concepts and adapt the activities for articulation/fluency/social skills. Below are some ideas to get started. I introduced my groups to the concept of bones by reading the book Bones (Science Readers: A Closer Look) . With my younger/SDC kiddos we read Skeleton Hiccups . Of course, you could read any Halloween themed book about skeletons to get into the mood. I also purchased some Halloween decor at Walmart: An (anatomically correct - this is important!) Skeleton , as well as a "Bag of Bones ". We used these props to talk about the different bones in the body and learned some of the scientific names. There are some great bones containing /r/ and /s/ - femur, humerus, skull, pelvis, ribs, spine, etc. that you can have your artic students practice. The bag of bones was great for guessing which bone was which by comparing them to the bones in the skeleton model. Bonus: I can reuse these guys as Halloween decorations! Students loved exploring the animal x-rays! Next, we got to the fun part!! I discovered two different sets of X-Rays on amazon - Animal X-Rays and Human X-Rays . We used the animal x-rays to compare the skeletal structure of different animals to that in a human body. I also had students try to guess what animal might be depicted by the x-ray. You can also have students compare and contrast the skeletal structure of two different animals. 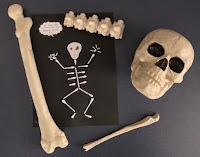 I used the set of human x-rays to solidify students' knowledge of the names of bones and our general skeletal structure by having them assemble the skeleton on white butcher paper. This was actually harder for many of my kiddos than they anticipated! They were allowed to use a diagram of a human skeleton, as a reference. When they were stumped, I gave them hints such as, "This is an x-ray of a tibia." They then had to reference the diagram to figure out where the bone would go. As an extension activity, we made the Q-tip skeleton that is plastered all over Pinterest. 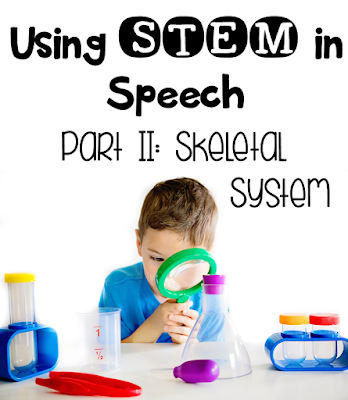 Students had to "earn" each bone by either saying their speech sound 5x or completing a language task. Tip: Make sure to cut all of the Q-tips prior to the activity, as it will save time in the long run. 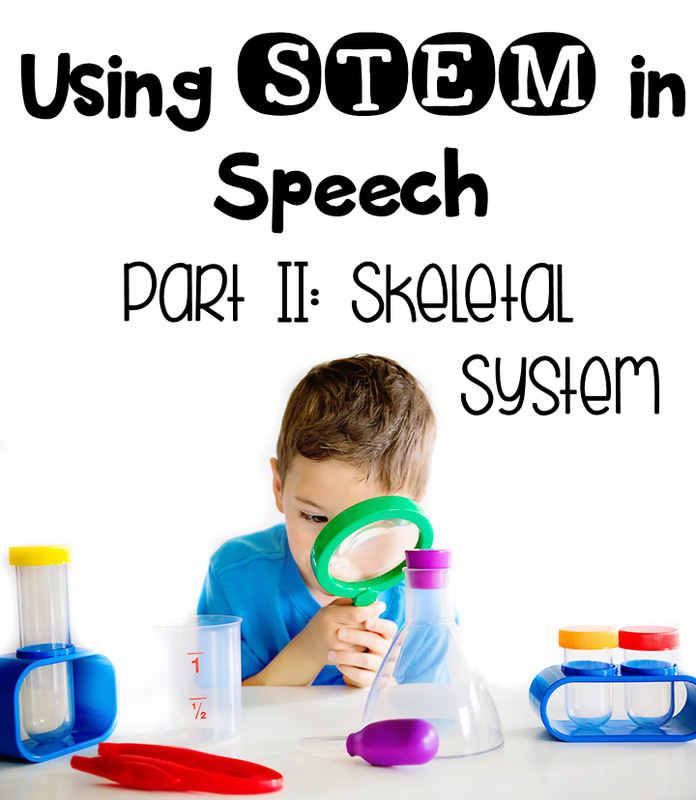 What I loved about this unit was that I was able to incorporate STEM in a Halloween-themed unit, while teaching students about important concepts AND working on their speech goals at the same time. Win-win! !